Download "ICE HOCKEY FOR NAIRABET"
1 ICE HOCKEY FOR NAIRABET Ice hockey is a team sport played on ice in which skaters use sticks to shoot a hard rubber hockey called puck into their opponent's net to score points. A team consists of four lines of three forwards, three pairs of defensemen, and two goalies. Five members of each team skate up and down the ice trying to take the puck and score a goal against the opposing team. 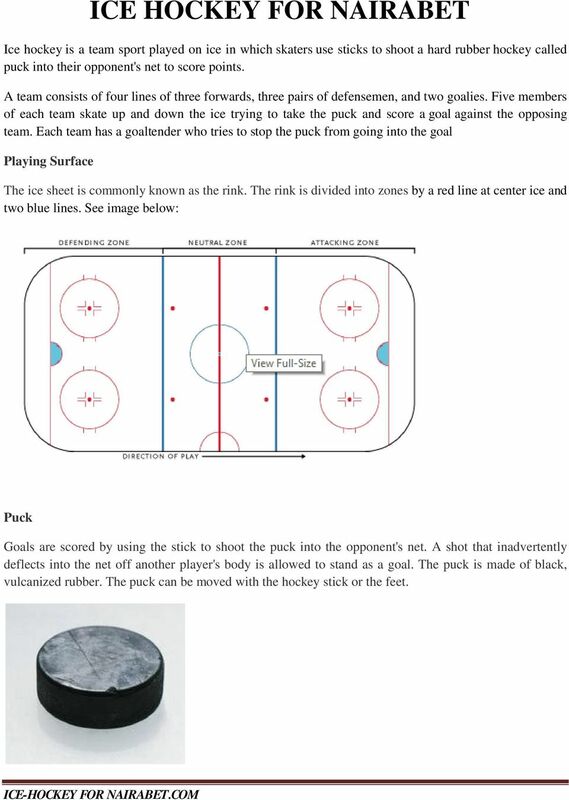 Each team has a goaltender who tries to stop the puck from going into the goal Playing Surface The ice sheet is commonly known as the rink. The rink is divided into zones by a red line at center ice and two blue lines. 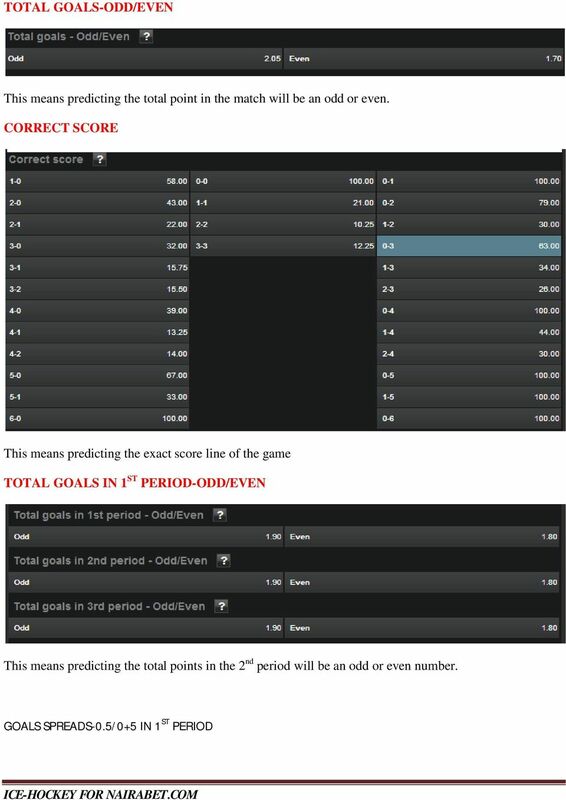 See image below: Puck Goals are scored by using the stick to shoot the puck into the opponent's net. A shot that inadvertently deflects into the net off another player's body is allowed to stand as a goal. The puck is made of black, vulcanized rubber. The puck can be moved with the hockey stick or the feet. 2 Hockey Stick The stick is used by each player and used to retrieve, control, carry, pass and shoot the puck. Net Nets at opposite ends of the ice, guarded by the goaltenders. The Game Clock The game is played in three periods, 20-minute each and the clock is stopped during all stoppages in play. If there is a tie after the three periods, there will be a five minutes over time, followed by a SHOOTOUT if no one scores. 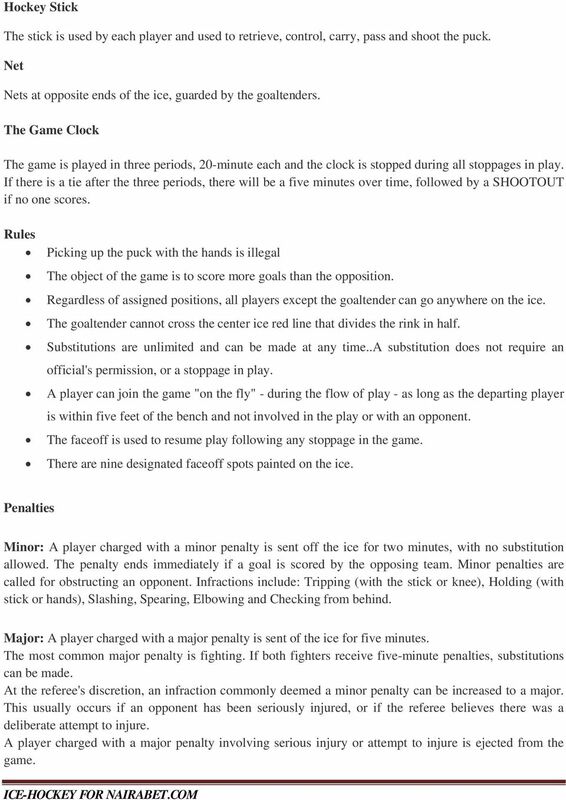 Rules Picking up the puck with the hands is illegal The object of the game is to score more goals than the opposition. Regardless of assigned positions, all players except the goaltender can go anywhere on the ice. The goaltender cannot cross the center ice red line that divides the rink in half. Substitutions are unlimited and can be made at any time..a substitution does not require an official's permission, or a stoppage in play. A player can join the game "on the fly" - during the flow of play - as long as the departing player is within five feet of the bench and not involved in the play or with an opponent. The faceoff is used to resume play following any stoppage in the game. There are nine designated faceoff spots painted on the ice. 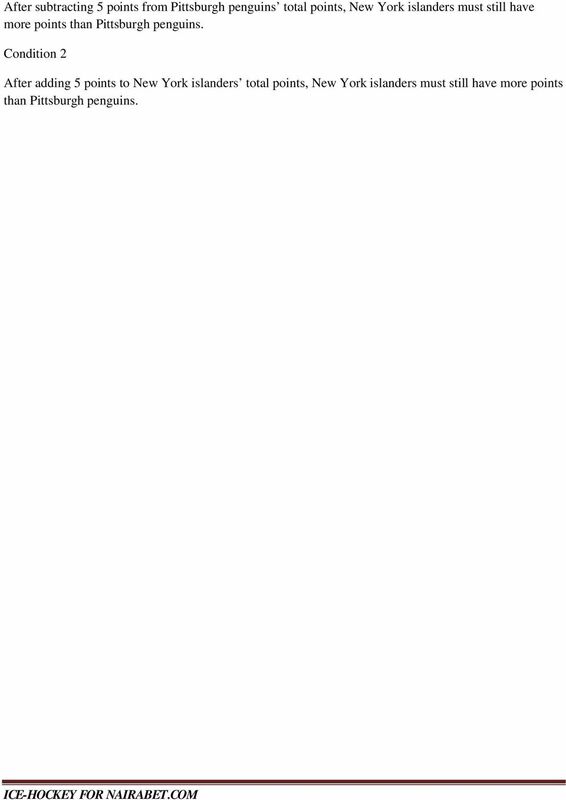 Penalties Minor: A player charged with a minor penalty is sent off the ice for two minutes, with no substitution allowed. The penalty ends immediately if a goal is scored by the opposing team. Minor penalties are called for obstructing an opponent. Infractions include: Tripping (with the stick or knee), Holding (with stick or hands), Slashing, Spearing, Elbowing and Checking from behind. Major: A player charged with a major penalty is sent of the ice for five minutes. The most common major penalty is fighting. If both fighters receive five-minute penalties, substitutions can be made. At the referee's discretion, an infraction commonly deemed a minor penalty can be increased to a major. This usually occurs if an opponent has been seriously injured, or if the referee believes there was a deliberate attempt to injure. A player charged with a major penalty involving serious injury or attempt to injure is ejected from the game. 7 After subtracting 5 points from Pittsburgh penguins total points, New York islanders must still have more points than Pittsburgh penguins. Condition 2 After adding 5 points to New York islanders total points, New York islanders must still have more points than Pittsburgh penguins. 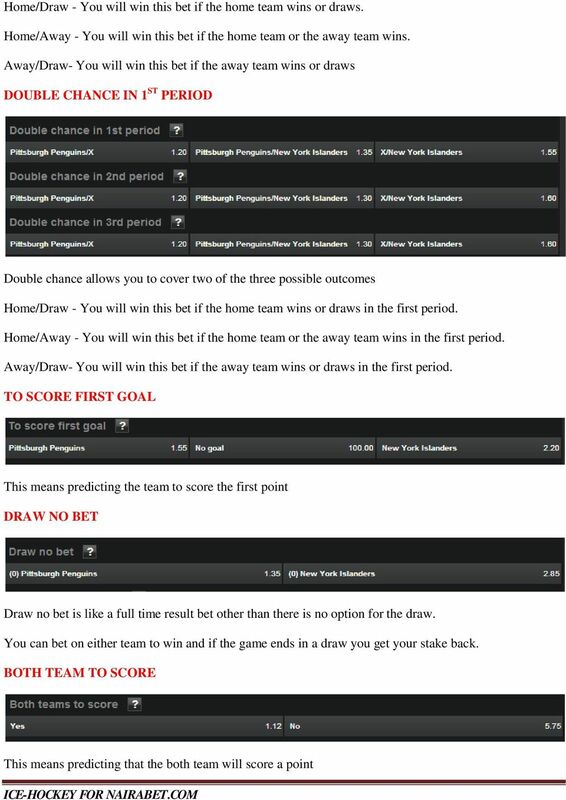 Live Betting Extra Rules Rules for General Main Live Lines The following rules apply for Live Betting: Markets do not include overtime unless otherwise stated. Lines are offered at the provider s discretion. 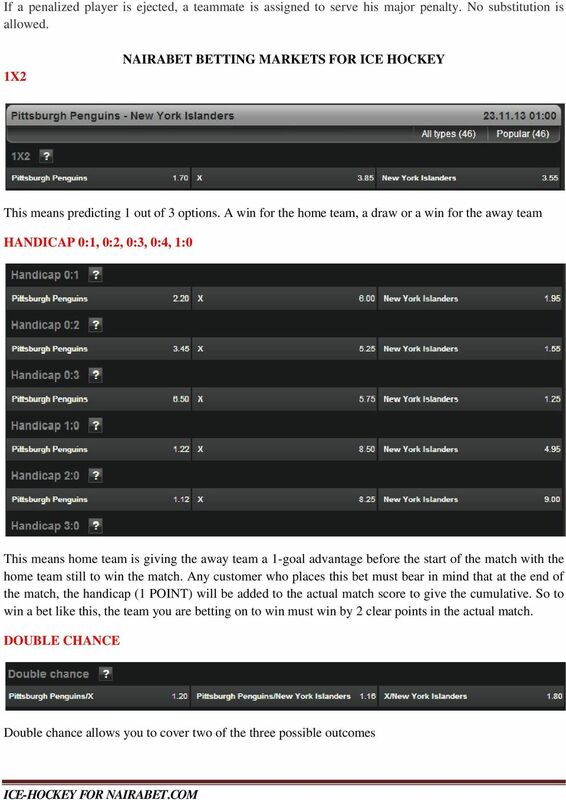 TOTOBET.COM SPORTS RULES TABLE OF CONTENTS NO. SUBJECT PAGE WELCOME TO THE WINNING SITE. CHICO SENIOR SOFTBALL RULES (revised as of 03/21/2016) 1. PLAYING RULES: Chico Senior Softball will use current SSUSA and NCSSA playing rules except as modified here. SSUSA rules can be found at: http://seniorsoftball.com/?page=7.